Is this a perfect house? 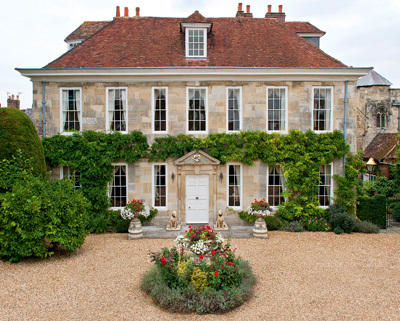 This week’s issue of Country Life sees the launch onto the open market, for the first time in 600 years, of exquisite Malmesbury House in Salisbury’s famous Cathedral Close, one of the finest, oldest and historically most important of the many Grade I-listed houses that head up a uniquely picturesque architectural grouping within this green, 80-acre walled enclave at the heart of the city in Wiltshire. Joint agents Knight Frank (020-7861 1080) and Savills (020-7409 9905) quote a guide price of ‘excess £5 million’ for the freehold of the beautifully restored, mainly 18th-century house, which sits tucked away in two thirds of an acre of secure, private gardens adjoining the 14th-century St Ann’s Gate at the eastern end of the Close. Originally known as Copt Hall, a 13th century canonry demolished in 1399 and rebuilt in 1416, Malmesbury House was remodelled by successive generations of the influential Harris family, who leased the house from 1660. It was later renamed in honour of the peripatetic 18th-century diplomat James Harris IV, created 1st Earl of Malmesbury in 1800. The building’s elegant Queen Anne front was commissioned by the Earl’s grandfather, James Harris II, and has been attributed to Sir Christopher Wren, but was, most likely, the work of local architect John Fort, Wren’s master builder. 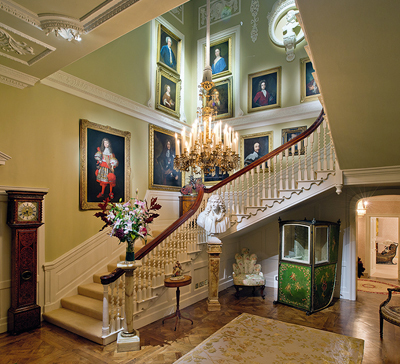 The 1st Earl’s father, James Harris III, who inherited a substantial fortune and the house in the Close on his father’s death in 1733, was responsible for the splendid interiors at Malmesbury House. A distinguished politician and classical scholar (although dubbed ‘a prig’ and a ‘coxcomb’ by Samuel Johnson), he was also a great lover of music and a close friend of Handel, a regular visitor who is said to have given his first concert in England in the music room above St Ann’s Gate, then part of Malmesbury House. Throughout its history, the house has been a favourite refuge of the great and the good. At the start of the Civil War, Sir George Vaughan, High Sheriff of Wiltshire, was living in the house and it was here that he raised forces in the county to support Charles I. Knight Frank’s Ed Cunningham points to the existence of a secret upper room in the Orangery, built in 1629, in which Royalists and other dissidents could escape the attention of government forces. Charles II also stayed at the house, in 1665, when he fled London to avoid the plague. He is said to have addressed the people of Salisbury from the projecting oriel window that overlooks St John Street and bears his coat of arms. Malmesbury House remained a leasehold property owned by the cathedral, before being bought privately by the evangelising Conservative MP John Cordle, who died there in 2004, aged 92. By the time its present owners, George and Jayne Apter, bought the house two years later, the building was in a fairly poor state of repair and it took a further two years of intensive restoration before they eventually moved in. 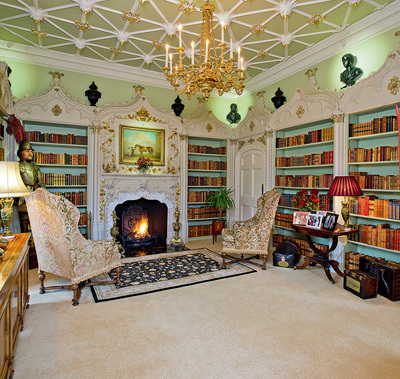 Few historic buildings can claim to be perfect, but the glorious interiors of Malmesbury House are as close as it gets, thanks in no small measure to Mrs Apter’s interior-design skills and her husband’s discerning eye as a lifetime collector of art and antiques. The classic Queen Anne house offers some 7,600sq ft of living space on three floors, including five magnificent reception rooms, an intimate vaulted study, a Clive Christian kitchen, nine sumptuous bedrooms, six bathrooms and a one-bedroom annexe with its own courtyard entrance. Highlights include the grand reception hall and the impressive cantilevered staircase, the well-proportioned drawing room with its painted panelled walls and high ceilings, the dining room with its lovely fireplace and stuccoed ceiling plasterwork and the library, one of the most spectacular rooms and a splendid example of Gothic Revival design. 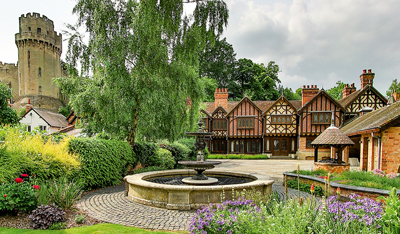 Equally splendid in its way is the revival of Grade II*-listed The Gables in Mill Street, Warwick, which has been transformed over time from four derelict medieval cottages into a manor house of considerable distinction. According to Paul Houghton-Brown of Sotheby’s International Realty in Stratford-upon-Avon, Warwickshire (01789 200900), who quotes a guide price of excess £3m for this remarkable house set below the towering ramparts of Warwick Castle, the intensive renovation of the house by its owner, Matt Sutherland, goes ‘far beyond’ merely restoring the glory of an historic building. In fact, there was plenty of history, but not much glory about the house when Mr Sutherland bought it in 2010 and set out to complete a ‘pet project’ initiated years before by its previous owner, but finally abandoned when he reached retirement age. ‘The house was structurally complete, but was basically a shell, with no flooring, no kitchen and no bathrooms,’ Mr Sutherland recalls. The first Warwick Castle was built by the Normans in 1068, with the 1st Earl of Warwick installed some 20 years later. The original motte-and-bailey fortifications were replaced by stone in 1260 and The Gables is believed to be a former terrace of workers’ cottages dating from that period. The castle and Mill Street were part of the Earl of Warwick’s estate until the 20th century and, in 1959, a consortium of residents bought the street. Today, The Gables, set in half an acre of enchanting private gardens that slope down to the Avon, is a tranquil haven nestled in a cobbled corner of this thriving town. Described by the agents as ‘a resplendent time machine’, the 7,000sq ft house, which boasts a great hall, three reception rooms, a kitchen/ breakfast room, six bedrooms, six bathrooms and a basement leisure complex currently under construction, is not only a masterpiece of craftsmanship and engineering, but also the realization of more than one man’s dream.